The city of Tenochitlan was soon to become one of the largest cities in the world. 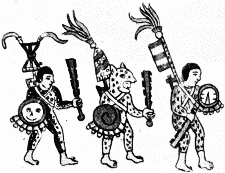 The power of the Mexica peoples became more consolidated, and they began to form alliances. Their military power grew as well, and they began to conquer peoples in the surrounding areas. At the height of its power, the Aztec Empire was organized and strong, but ruled with fear. In 1519, a clash of cultures was to take place, unlike anything before it. Although there was much tragedy in both the Spanish and Aztec empires before this, the meeting of the two civilizations was disastrous. In a few short years, the culture and structure of one of histories greatest empires would have virtually vanished. It was against the law to be drunk in public in the Aztec empire, unless you were over 70 years old! Each Aztec home had a steam bath! It is said that the major Aztec weapon could chop off the head of a horse with one blow! Read on for much more ancient Aztec history!